Hearing from the school that your child isn’t doing well or is causing problems for the teacher is a dreaded scenario for many parents. A typical response is to crack down on the child by lecturing, showing disappointment, and threatening consequences. As a parent coach, I recently received an email seeking advice. I asked Jill* if I could share our correspondence since this is such a common issue. Good morning! Our daughter Lisa is in first grade, and her teacher reports that she is disruptive because she wants to make people laugh and entertain her classmates. Her intentions aren’t to frustrate her teacher, however, she’s not responding to numerous reminders during the day to stay focused. Her teacher makes a tally mark on a little piece of paper each day when the disruptions happen, and sometimes she’ll have eight tallies during the day. Clearly this system of tallying disruptions is not working because it’s not getting better. I fear Lisa is starting to believe that no matter what she does, she’s not a good student and will always come home with tally marks. My husband and I feel as though we should intensify the consequences at home to help Lisa understand the importance of obedience and listening to the teacher. We don’t want her to feel like, no matter what she does, she is a failure. I really appreciate your thoughtful approach to the scenario you describe; a good balance of wanting to honor the teacher while being concerned about what messages Lisa is receiving in the midst of it all. 1) Focus on What Your Child Does Well. Make it a point to verbally affirm Lisa, especially times she shows self-control or respect for other students. Maybe show the teacher the ABCs of affirmation. 2) Direct your child’s strengths toward honoring actions, not misbehavior. One of the best ways to help kids who are seeking attention to use their energy for good, is to involve them in a meaningful task. What could she do in the class that would use her confident expressiveness to benefit her teacher and classmates? Could she give an announcement or help a classmate who struggles? Could she bring one joke to school everyday to start off recess? If the teacher feels consequences are necessary, they need to make sense to Lisa and build wisdom in her. Since her behavior has impacted her teacher and class it would make sense that she does something to bless those impacted. Encouragement and eliciting cooperation is much more effective in helping a child learn and grow than trying to control their behavior. Instead of trying to curb behavior that happens outside the home, parents are most helpful with school struggles when they work to teach the wisdom and self-control that will help their child succeed at school. Perhaps curious, non-judgmental questions (just a few at a time) could help Lisa begin to see how her behavior impacts her teacher and classmates. What are the basic rules your teacher has for all her students? What might be the reasons for those rules? Which rules are easiest for you to follow? What makes it easy? Which ones are most difficult and why? What are ways that you are respectful of your teacher, and how is that helpful? Are there some ways you could be more respectful? Let me know how things go! Lisa is a good kid who needs wise guidance. You can provide that! We are here to help! I can report that great, honest conversations continue between my husband and I and Lisa’s teacher, Beth, to ensure Lisa’s success. When I shared portions of Chad’s email with Beth, she loved the idea of praising Lisa for her “wins” and was in full agreement that she would never want the narrative to be “Lisa, you are a failure/a naughty girl/disruptive/etc”. Beth cares very deeply for her students and loves trying different ideas to bring the best out in her students. Beth changed her tally system from keeping track of all infractions, to giving Lisa more general feedback about her behavior. Even if her day doesn’t go so well, when she comes home we talk about ways she can improve, and we don’t make her feel as though she’s disappointed us. Beth also keeps Lisa’s desk at the front of the class to help ease some of her classmate distractions and has also found many ways throughout a given week to solicit Lisa’s help on miscellaneous projects. Lisa enjoys helping her teacher and I’m so glad they continue to have a great relationship. 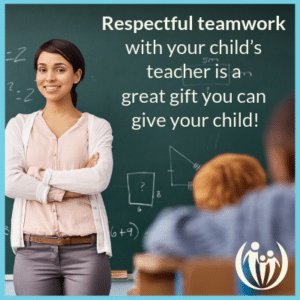 Respectful teamwork with your child’s teacher is a great gift you can give your child. When a child knows that teachers and parents all want to encourage and equip them to do their best, they usually rise to the “We are all working together.” and “You got this!” messages they’re receiving! * To protect the privacy of this family, pseudonyms and stock photos have been used. ← Are You Raising a Blessing in Disguise?